Tickets are available for the University of Hawai’i basketball team’s annual awards banquet, which is set for April 11 at the Hilton Hawaiian Village Coral Ballroom. No-host cocktails begin at 5:30 p.m., with dinner and program to start around 6:30 p.m. The banquet is a celebration of the 2017-18 season, as well as a fundraiser for the UH basketball program. 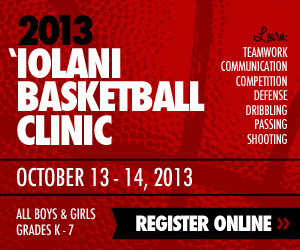 Proceeds will go toward summer school scholarships for men’s basketball student-athletes. Tickets are $150 per person, or tables are available for $1,500 and $2,000. Reservations are recommended to be made before April 4. 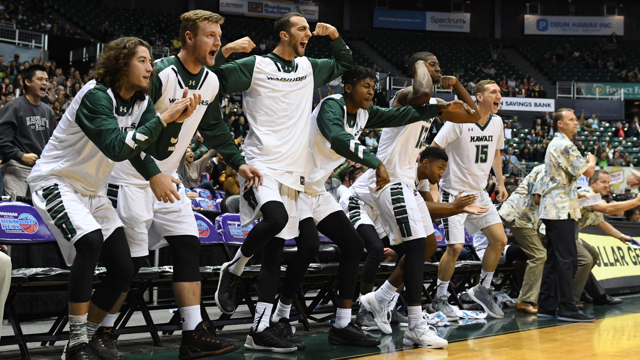 The Rainbow Warriors recently completed a 17-13 overall season with a one-point loss to UC Irvine in the quarterfinals of the Big West Conference Tournament. To purchase tickets or for more information, call 956-6501.
fun season . Got to be NCAA or NIT tournaments or bust! Agree with Eagle. This is official year one? Thanks to Mike. Gibson and Zach. Grads! Ido went back to Israel for military service, ending his UH career (for now ?) ? I think Yuval Katz and Haim Shimonovich did Israeli military service too. ? Haim had to sit out a little bit I think..? Then got to play till senior year. Wonder if all those 6’11” to 7’0″ bigs affected him? I guess coach knows. Eran still has to emphasize good smalls / scoring wings to win BWC. Nice to have bigs..however smalls help to get wins finish games. Stansberry was a starter and first-team all-conference guard on a CCSF team that went 33-1 and won the California Community College championships. Here’s a video from his freshman season. Take it for what it’s worth because it’s a highlight video, but he looks pretty good. Thanks for the link, islandman. Check out Stansberry’s 3-pointer just before halftime. A Mark Campbell and Matt Lojeski skillset would be great too. Smalls. Eran score pgs and wings athletic scorers great. JC all region would be nice .or another Q senior year caliber! Ido will be playing professionally after meeting his military commitment. Stansberry – hope he signs. Incoming big men have got to produce quickly. This was a very tough loss for the team, program and fans that traveled to the tournament. I will comment on a couple of things that I have said on the post game radio shows. I get running an offense and making the extra pass to find the open player, however there were many times where a shot had to be forced up to avoid the shot clock violation. Gary Dickman and Bobby Curren have both defended this by saying that the team did not have lots of shot clock violations but the response is that they have passed up many good looks throughout each possession prior to forcing up a bad shot to avoid the shot clock from expiring. Coach Ganot definitely needs to tweak this part of the offense. We have another Norm Chow in basketball. Coach Ganot should look at statistics when the team had a lead in the second half, only to lose it late in the game and then lose the game. When you have a lead and bring the ball down court with numbers or an opportunity to hit a good shot, take it. Keep pressuring your opponent and keep your players running. This helps to keep the players playing. You don’t pull it out and set up your offense and run clock. As a result of Ganot’s game plan, we have seen the team get cold, players start getting shy to take the shot for fear of missing, and then miss shots after running the offense or turn it over. Its like chess, you need to stay on the offensive by keeping your opponent in check. Bring it down court and hit the open shot or take it strong to the basket. Push the other team to commit fouls which eventually will put UH in the bonus or double bonus. Also, this will put the opponents in foul trouble or foul out. Concern about running up the score you say? Running up the score is when you have the game won, continue to shoot the 3, and with little time for your opponent to win. From 10 minutes out and until the game is a sure win, we need to score. Lastly, in the game against Irvine how do you play a player who has a shoulder injury when you have others on the bench that are good to go? While watching the game, it was quite evident that Leland’s shoulder injury was taking its toll and he could not shoot or defend with his arms up. Gotta fix these things quickly. Gary Dickman, Bobby Curren, and Ganot are so obsessed with assists. They seem to value them more than points scored. Ganot over coaches the players, stunting their progress. Benjy Taylor often said one of the reasons his team was successful was because he didn’t overcoach the players. For those critical of Ganot,he is mentioned as a possible candidate for the San Diego job, per Brian M.
Would seem to me to be easier to recruit to San Diego than to Hawaii. Eran Ganot downplays the HoopDirt report and tells the Star-Advertiser he’s happy where he is. Story in tomorrow’s print edition. Really wouldn’t be the end of the world if Ganot left! I think he should spend more time as an assistant coach though rather than taking a head coach position. Tavs – I have to agree with you. Benjy Taylor would make a good replacement if he left and hopefully recruit better than Ganot. Ganot’s only noteworthy recruit is Buggs. Recruits under him include Noah Allen, Sheriff,Gibson, Jack, Sai among others. Sheriff was Big West Hustle Player of the Year, Jack was Best 6th player (and Noah was 1st team All Conference in 2016-17). Program is on an upswing. Benji and Fib never coached up the team to win a title and go to ncaa’s. Taylor had too many off the court issues and had a number of head cases that didn’t pan out ie Fleming and Vander both with some of the worst attitudes any coach would have to put up with. Ganot is a good in game coach and has so far a good recruiting year. We need to allow him the chance to get this class in place and make a run for the title this coming season. Citing fairness to USD? How does that work? I guess that means he did apply for the job. If he didn’t apply for the job then he would just say that he didn’t. If you asked any coach if they applied for a head coach job that they didn’t apply for then they’d flat out tell you that they didn’t. Islandman, I’d take Gib’s recruits over Ganot’s any day. Ganot got to the dance with Gib’s recruits. Ganot is a terrible coach when games come down to the wire. It’s like the team never has a clue what to do and the ball always ends up in the wrong player’s hands. Never tells his players to apply full court pressure and can’t coach his team how to handle full court pressure. I really think he needs to get more reps as an assistant before moving on to another head coaching job. He now says he did not apply for the San Diego job or any other one. It’s taken a couple years for Ganot to steady the program and I believe the build now starts with this recruiting class. The three bigs have potential so let’s see who fills the two remaining scholarships. I’d like to see where the program is at in two years. TAVS: You correctly point out that “Ganot got to the dance with Gib’s recruits.” That said, there are some who feel that neither Gib nor Benjy would have taken the 2015-16 team as far as Ganot did. Even Eran admits inherited recruits that stayed for his first year historic first NCAA tournament victory and 28 wins key. Eran did steady down program with help of UH. We are grateful everything came together. Wish coach Taylor had a chance. Believe he could recruit and win BWC too. He won 22 games and made it to championship game few minutes away from making dance and convinced lot of guys to stay with new coach Ganot. Hope things work out for Eran whatever he decides. True. We all know recruiting good athletes And good BB coaching key to consistent post season runs. Ganot has to get great guards. Small forwards. Mr Bill great synopsis and hoops analysis. Might take awhile to get back to NIT and NCAA s.
Valdes newcomer of the year in Mexico pro league. Wow highlights. Happy for Valdes. Too bad he never finished his college degree. We are grateful coach Taylor and AV their ohana and others stayed together for 22 wins ..then 28 win(total 50 wins over 2 years)with Ganot NCAA first round win. Q. AV. Rod. Janks . Some very good athletes and scorers. Aaron type players. 46″ plus very needed for Bows! Great hilites! Seems like a lot of those former recruits doing well overseas.Saw NWC had spot on raptors league team. G. Nevels doing well. Standardinger . Spearman. Wow brings back good memories!! Meant to say guys who can score defend with 46″ very jump would rock SSC! NWC had spot on early this year Toronto g league team. Bows need those type of athletes who can get some bwc championships! Stansberry commits to Hawaii, per newspaper. Brian McInnis reporting CCSF 6-3 sophomore guard Eddie Stansberry has verbally committed to Hawaii. Stansberry scored 21 points in CCSF’s title-clinching California CC game, and was named all-tourney. One more scholarship to fill.